We often hear glacial geologists speak of numerous ice ages, as if it is certain. They hypothesize up to 30 different ones, each separated by interglacials, during the past 2.5 million years.1 An interglacial is the period between ice ages when all of the glaciers melted, except for Antarctica and Greenland. Each ice age is believed to have occurred at regular intervals of 100,000 years during approximately the past million years. The ice sheets are said to build up in 90,000 years and melt in the subsequent 10,000-year interglacial. Before a million years ago, ice ages cycled about every 40,000 years, they believe. 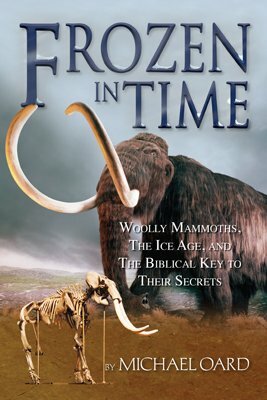 Furthermore, uniformitarian scientists also postulate more ancient ice ages as far back as 2 to 2.5 billion years ago (see section later in this chapter). Figure 11.1 shows a plot of these ice ages in the evolutionary/uniformitarian time scale. Figure 11.1 Schematic of the five main ice age periods in uniformitarian earth history. The Archean “ice age” is still speculative. 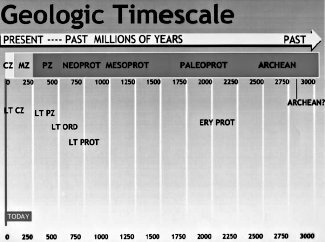 The ice age labeled LT CZ (late Cenozoic) represents the post-Flood Ice Age that uniformitarian geologists call the Pleistocene or Quaternary. The other four labeled “ice ages” or “ancient ice ages” are considered to be caused by giant landslides during the Genesis flood and not real ice ages. In the mid 1800s, when scientists began to realize that ice sheets had overrun large tracts of land in the mid and high latitudes, they at first thought there had been only one ice age. As they began to look at glacial debris in more detail they concluded that ice ages may be more complicated than they had originally thought. At the periphery of the ice sheets they found glacial debris layers separated by sand and gravel. This, they thought, was proof of multiple glaciations. The idea of multiple glaciations caught on. It quickly became the new ice age paradigm — a supermodel in which to fit subsequent research data. After all, according to the uniformitarian principle, if there was one ice age, why not many? Multiple ice ages, to many scientists, was a more satisfying idea because the idea conformed to their assumption of uniformitarianism and helped fill its need for time. A number of scientists, however, still thought the evidence was equivocal and that one ice age could cause multiple till layers. They attributed the layers to an ice sheet edge advancing and retreating. But their view eventually lost favor. That generation of scientists died and a new one took its place, one that was conditioned to think in terms of multiple glaciations. The new breed of geologists went on to consider how many ice ages there were. Scientists settled on about four ice ages in the early 1900s, due to the work of Albrecht Penck and Eduard Bruckner, who convinced the world that four river terraces north of the Alps showed meltwater deposits from four different ice caps. So, the four-ice-age hypothesis was born and caught hold. Scientists who believed in an early version of the astronomical theory of the ice age saw more than four ice ages in the river terraces, since their theory demands many more than four. However, the astronomical theory was considered too feeble to cause ice ages, so the belief in four ice ages prevailed and was accepted doctrine for about 60 years. From the Alps research, glacial geologists working in other areas also saw only four ice ages.2 It became conventional wisdom to postulate four ice ages, based on deposits at the edge of the ice sheets in the north central United States and in northern Eurasia. Table 11.1 shows the glacial and interglacial classification from the Midwest that was in vogue for about 60 years. There is an interesting progression that occasionally occurs in science, especially historical sciences, that wrong concepts get “proved” over and over again. This is called the bandwagon effect or reinforcement syndrome. During the time when the four-ice-age theory dominated thinking, all relevant data was fitted into this theory. There appeared to be no contradictions. It was all fiction, developed on preconceived ideas of how glaciers are expected to behave. In the 1970s, ideas changed and now scientists are postulating 30 regularly repeating ice ages! Nevertheless, as with all ruling theories, all of the data has been, once again, massaged into the new ruling theory. Few scientists dare risk their careers and grant money to point out the theory’s glaring contradictions. History indicates that the number of glaciations has never been on a solid footing. It has changed according to the popular ideas of the time. In an earlier chapter, I showed just how meteorologically difficult it is for any ice age to develop using present processes. For snow to survive a summer in the northern United States, summer temperatures would have to drop to an average of about 20°F (-7°C), 50°F (28°C) below normal, and the snow needs to be regularly replenished. According to uniformitarianism, this abnormal climate has to persist for thousands of years. If one ice age is difficult to produce, how much more difficult would it be to form 2, 4, 15, or 30 ice ages in succession? We shall not, therefore, consider these [previous] glaciations in any detail — a task which would in any case be difficult because of the scarcity of supporting evidence. The glacial deposits themselves point to only one ice age. Earlier in this report, the nearness of most glacial boulders to their source was cited as evidence that glacial transport is generally short. Even stronger evidence to support this view can be read from the tills themselves. Where the direction of movement carried a continental ice sheet from one terrain to another of markedly different rock type, the tills derived from each terrain are predominantly restricted to the area of their corresponding source rock. A short distance of transport would be expected in one ice age, but in multiple ice ages, the debris should be bulldozed farther and farther from its source. 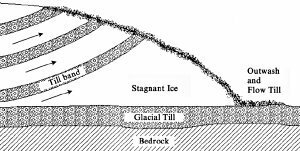 Since most glacial till is from local bedrock, one ice age is a more straightforward deduction. Figure 11.2. Sandstone spires in southwest Wisconsin indicating the area has never been glaciated, otherwise the ice sheets would have planed the area. Figure 11.3. Close-up of a sandstone spire shown in figure 11.2. A few areas within the periphery of the ice sheet in North America were never glaciated at all. These are called driftless areas and have been mentioned in a previous chapter. 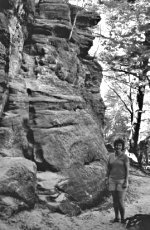 Sandstone spires (that were not planed off) are evidence that the driftless area in southwest Wisconsin was never glaciated (figures 11.2 and 11.3). How can a thick ice sheet over a 100,000-year period in the uniformitarian paradigm have missed these areas? Even more puzzling is how 30 or more ice ages could have missed these driftless areas. A thin ice sheet that formed and melted rapidly has a much greater chance of leaving a few areas unglaciated at the margin than many long ones. Figure 11.4. Schematic showing that the same topographic roughness of the granite in southeast Canada continues under the sedimentary rocks to the south. With the many presumed glaciations of Canada, Canada’s bedrock should be heavily eroded. However, the terrain, in truth, shows little erosion.7 The bedrock under the local cover of sedimentary rocks is of the same topographical roughness as that found on the exposed crystalline bedrock (figure 11.4). The characteristics of ice age animals points to a single ice age. During the approximately two to three million years that uniformitarian scientists allot to multiple glaciations, the animals remained much the same.8 There is very little fossil information available to differentiate between various glacials and interglacials. Their explanation is that very little evolution took place because the many ice ages apparently did not stress the animals to change. Then for some mysterious reason, dozens of large mammals and birds went extinct after the “last” ice age. This appears doubtful within their evolutionary paradigm. One ice age with characteristic plants and animals is a more reasonable deduction. If there were multiple interglacials, animals such as reindeer and woolly mammoths would successfully recolonize previously glaciated territory. Their bones should be abundant in these areas, but they are rare and are found mainly at the periphery of ice sheets and in non-glaciated areas. Lastly, if the uniformitarian version of multiple ice ages were true, at least 1 of the 30 ice ages should have glaciated the lowlands of Siberia, Alaska, and the Yukon. Could it be there really were no interglacials? Glacial reconstructions commonly assume a multiple-glaciation hypothesis in all areas that contain a till cover. It all adds up to a strong case for one recent Ice Age. How can one Ice Age explain the evidence for multiple ice ages? Although scientists have been operating under preconceived concepts for interpreting glacial data, they do have some physical evidence that supports the multiple glaciation hypothesis. This mainly consists of presumed interglacial deposits between layers of till and the old appearance of some glacial debris, especially in the north-central United States. Long-standing problems of interpretation of complexly interbedded tills of the Pleistocene glaciations have been resolved as a result of the realization that not all tills are of subglacial origin, and that a formation of several tills interbedded with meltwater stream deposits may be the product of a single advance and retreat of the glacier. Figure 11.5. Shearing of basal ice and debris at the snout of a glacier. Retreats and advances of the glacier cause a complex mixture of till, flowtill, and outwash deposits after the ice melts that have been mistaken for multiple glaciation. 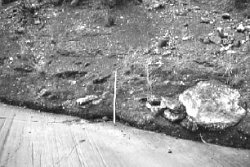 Derbyshire12 even shows how shearing layers of debris-rich till over a stationary lower layer of ice would result in stacked debris bands that look, upon melting, like multiple till sheets (figure 11.5). Most of this shearing takes place at the ice sheet margin and can be repeated many times. Other authors confirm Derbyshire’s conclusion. The suite of landforms was interpreted as evidence for multiple advance and retreat cycles of the Laurentide ice sheet. These interpretations are brought under question with the conclusion that there was only a single glaciation, the Late Wisconsinan, of the western part of the Alberta Plains . . . .
. . . glacial deposits are virtually unfossiliferous; interglacial accumulations, if fossiliferous, occur in isolated and discontinuous patches . . . .
Eyles17 finds that organic material associated with till can be incorporated by glacial readvances. So, a dynamic ice sheet that oscillates at its margin would be expected to pick up organic remains, especially plant material, now and then. If an ice sheet advances far enough, it could cover forests and animal bones that would be located just south of the sheet, especially if the Ice Age had mild, wet winters and the animals and plants lived close to the edge. In the Midwest, sticky clay layers, called gumbo, are found either between till sheets or on top of glacial debris. This has been interpreted as a soil that took much time to develop during an interglacial period. However, many of these “soils” are controversial. Some soil scientists believe this clay can form in areas of poor drainage, which means that the clay can form quickly in a wet climate. It is even possible that some of the clay layers could form at the bottom of a lake adjacent to the ice sheet. Soils usually have an organic layer at the top, but the Midwest clay layers nearly always are missing the top organic layer.18 In conclusion, the idea that these clay layers represent interglacial times between ice ages is a stretch. The old, weathered appearance of some glacial deposits could be explained by several processes within a post-Flood ice age. One possibility is that much heavier precipitation in an equable climate could cause faster weathering. Another, more likely, possibility is acid rain. One of the primary volcanic gases during the Ice Age was SO2. When combined with water, SO2 will form sulfuric acid. The resulting acid rain would tend to cause very rapid weathering and an old appearance in a short time. In summary, one dynamic ice age during the unique post-Flood climate can account for many, if not all, of the features of the glacial deposits that appear to support multiple glaciations. Other interpretations, like clay soils, may simply be a misinterpretation. Is the next ice age due soon? A global superstorm is coming soon, say Art Bell and Whitley Strieber19 in their provocative book The Coming Global Superstorm. They give dire warnings of a storm so devastating that it will quickly usher in another ice age. The entire American Midwest would be under a sheet of ice, one that would extend across Siberia and northern Europe as well. . . . If the past is any indication, the earth is at the end of another such warm period, poised to descend into a new Ice Age. Their evidence for such a frightening scenario consists of the popular idea that ice ages have repeatedly occurred over 90 percent of the past 2.5 million years and that each intervening warm spell lasted only 10,000 years. According to uniformitarianism, the last ice age ended about 10,000 years ago, so the next one is about due. To further support their theory, they contend that solar radiation absorbed in the higher latitudes has fallen to the level of the peak of the last ice age. This is thought to be due to the earth’s orbital geometry in accordance to the currently popular astronomical theory of the ice ages. This is an example of how uniformitarian beliefs can get us into a lot of trouble. As we already know, ice ages are not easy to develop. Although the summer radiation at higher latitudes is similar to what it was at the peak of the Ice Age, the world is nowhere close to producing another ice age. 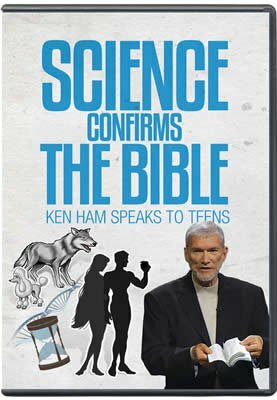 Secondly, there was only one trigger known to be strong enough to produce an ice age — the Genesis flood. God has promised not to send another Flood on the earth. The rainbow’s association with rain and thunderstorms is a frequent reminder of His promise from Genesis 9:11–17 (figure 11.6). If there will never be another global Flood, then there obviously will never be another ice age. Were there ancient ice ages? The Carboniferous tillites cannot be accepted by creationists as being of glacial origin for the obvious reason that the tillite formations are both overlain and underlain by fossiliferous strata, which are deposits of the Flood. During that great inundation, which lasted the better part of one year, there could have been no land ice formed by accumulation of snow. Tillite is the consolidated equivalent of glacial till. I believe Strahler is correct in that there could have been no land ice or glaciation during the Flood. Then how do we explain the rocks that are used as evidence for ancient ice ages? Figure 11.7. Hardened glacial till. Note the stones of various sizes embedded in a finer-grained matrix. The rocks representing these assumed ice ages look like hardened glacial till (figure 11.7). Furthermore, they exhibit other features that are thought by many to only be caused by ice. 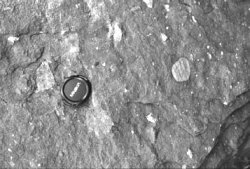 They show striated rock surfaces, striated rocks within the till, and stones in finely layered sediments. 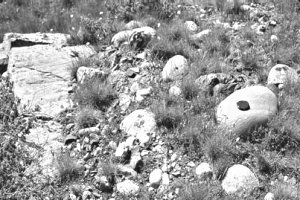 Figure 11.8 shows a picture of striated and polished bedrock below “tillite” from the most famous ancient glaciation, the late Paleozoic or Carboniferous/Permian “ice age” from southern Africa. The stones in finely layered sediments are suggestive of lakes adjacent to a glacier in which debris-rich icebergs break off and float out over the lake. As the iceberg melts, stones in the ice are dropped into the fine mud on the lake bottom. Supposed ancient ice ages are not unlike other challenges from geologists to the Genesis flood and the creation’s short time scale. Further analysis of the data is called for, and it provides a different explanation for these rocks.24 The rocks in question have a number of peculiar properties suggesting that they likely are not ice age related. First, the vast majority of these “tillites” are marine deposits. Second, they hardly show the dimensions of glacial debris, being geographically small and commonly thick, unlike glacial deposits that are the opposite. Third, the stones in the “tillite” are generally small and random, while glacial deposits from the recent Ice Age commonly contain masses of boulders. Fourth, there are a number of geological features for the presence of ice that should exist in these “tillites” but are absent. Fifth, paleomagnetism indicates that most of the numerous “ice age” deposits older than 500 million years in their geological time scale occurred near the equator. This data has spawned the serious consideration that the earth was totally glaciated for several long stretches of time from about 3 billion years to 500 million years ago.25 Lastly, the so-called glacial debris is intimately associated with warmth indicators such as carbonates and dolomites. Figure 11.9. Landslide debris that scratched the bedrock. Some of the stones in the debris are scratched. To repeat the most important point, great caution is urged in the use of striated stones as glacial pointers. It is a point that has been stressed time and again by many stratigraphers, without apparently leaving much impression. It seems that geologists have developed too strong a bias toward ancient ice ages to seriously consider other mechanisms for the observed rocks. The very dynamic Genesis flood produced rapid sedimentation and landslides of unstable sediments. These landslides could duplicate the large scale of some of these “tillites.” Landslides would be caused by tectonic motion and huge earthquakes that occurred during the Flood. It is known that the larger the landslides, the farther they travel. Hence, monstrous Flood landslides are bound to cause some unconsolidated sediments to slide long distances and come to rest on nearly level strata, as is observed in these supposed ancient ice age deposits. Landslides in the Genesis flood can also result in striated bedrock, striated rocks in the debris, and other supposed glacial features. The Flood is probably the only possible mechanism that can explain one unique feature of a “tillite” in the Sahara Desert. A grooved substratum has been observed in the Sahara Desert that covers many hundreds of square miles. However, in the Sahara Desert these grooves mostly all point north! Ice sheets have never been observed to produce such consistent directional indicators over such a wide area. Large underwater landslides during the Flood would be expected to continue moving in the same direction once the motion was initiated, and thus groove and striate the bedrock in the same direction over many hundreds of square miles. Previous Chapter Catastrophic Melting Next Chapter Do Ice Cores Show Many Tens of Thousands of Years? Kennett, J.P., Marine geology, Prentice-Hall, Englewood Cliffs, NJ, p. 747, 1982. Bowen, D.Q., Quaternary geology: A stratigraphic framework for multidisciplinary work, Pergamon Press, New York, pp. 10–19, 1978. Oard, M.J., An Ice Age Caused by the Genesis Flood, Institute for Creation Research, El Cajon, CA, p. 135–166, 1990. Sugden, D.E., and B.S. John, Glaciers and landscape: A geomorphological approach, Edward Arnold, London, p. 133, 1976. Feininger, T., Chemical weather and glacial erosion of crystalline rocks and the origin of till, U.S. Geological Survey Professional Paper 750-C, U.S. Government Printing Office, Washington, DC, p. C79, 1971. Eyles, N., Glacial geology: A landsystems approach; in: Glacial geology: An introduction for engineers and earth scientists, N. Eyles (Ed. ), Pergamon Press, New York, p. 4, 1983. Bowen, Quaternary geology, p. 38. Young, R.R., J.A. Burns, D.G. Smith, L.D. Arnold, and R.B. Rains, A single, late Wisconsin, Laurentide glaciation, Edmonton area and southwestern Alberta, Geology 22:683, 1994. Eyles, N., W.R. Dearman, and T.D. Douglas, The distribution of glacial landsystems in Britain and North America; in: Glacial geology: An introduction for engineers and earth scientists, N. Eyles (Ed. ), Pergamon Press, New York, p. 222, 1983. Derbyshire, E., Glaciers and environment; in: Winters of the world, B.S. John (Ed. ), John Wiley and Sons, New York, p. 77, 1979. Imbrie, J., and K.P. Imbrie, Ice ages: Solving the mystery, Enslow Publishers, Short Hills, NJ, p. 56, 1979. Oard, M.J., Mid and high latitude flora deposited in the Genesis flood — Part II: A creationist hypothesis, Creation Research Society Quarterly 32:138–141, 1995. Beaney, C.L., and J. Shaw, The subglacial geomorphology of southeast Alberta: Evidence for subglacial meltwater erosion, Canadian Journal of Earth Sciences 37:51, 2000. Charlesworth, J.K., The Quaternary era, Edward Arnold, London, p. 1025, 1957. Eyles, Glacial geology, pp. 9–16. Birkeland, P.W., Soils and geomorphology, Oxford University Press, New York, p. 33, 1984. Bell, A. and W. Strieber, The coming global superstorm, Pocket Books, New York, 2000. Ibid., pp. 13, 103, 139, 160. Hammer, C., P.A. 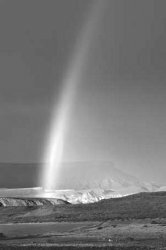 Mayewski, D. Peel, and M. Stuiver, Preface to special volume on ice cores, Journal of Geophysical Research 102(C12):26, 315, 1997. Oard, M.J., The Greenland and Antarctic ice sheets: Old or young? Institute for Creation Research, El Cajon, CA, 2004. Strahler, A.N., Science and earth history: The evolution/creation controversy, Prometheus Books, Buffalo, NY, p. 263,1987. Oard, M.J., Ancient Ice Ages or Gigantic Submarine Landslides? Creation Research Society Monograph Series No. 6, Creation Research Society, St Joseph, MO, 1997. Kirschvink, J.L., E.J. Gaidos, L.E. Bertani, N.J. Beukes, J. Gutzmer, L.N. Maepa, and R.E. Steinberger, Paleoproterozoic snowball earth: Extreme climatic and geochemical global change and its biological consequences, Proceedings of the National Academy of Science 97(4):1400–1405, 2000. Schermerhorn, L.J.G., Late Precambrian mixtites: Glacial and/or nonglacial? American Journal of Science 274:681–682, 1974.